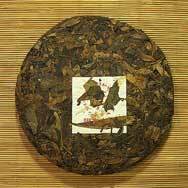 Bai Nian Qiao Mu Zhang Xiang Bing Cha, which means "A century old Arbor Tree Camphor Fragrance Tea Cake" is compressed using tea leaves harvested from very old (at least a hundred years old) Arbor tea trees. 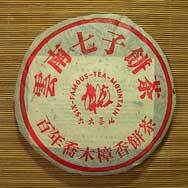 The tea has strong camphor fragrance and taste. I like this puerh:very little camphor taste at the beginnin but very special sweet liquor on the tongue. I don´t like the leaves but I love his pure golden color infusion. Very big leaves, camphor fragrance. Amber-colored liquor, saliva-stimulating ´minty´ taste. Good cha qi. I think this is a good puer. To my disappointment though, I didn’t really find the camphor taste. But it’s a good piece of tea anyways. This tea is more aged already than I expected. The liquor is already a golden brown. It has a distinctive taste, but its a nice drink. Not too harsh or bitter, yet it has a strength to it. It gives me the impression it will only improve over time. 2004 in my experience was a good year for 6 famous mountains cakes - but they tend to be cakes with rather strong tastes and are not as "smooth" and somewhat bland that really high end cakes tend to be with other brands. I’m impressed with this tea--a bit of a "sleeper," in my opinion. Am generally not a fan of 6FTM stuff, but there’s sufficient complexity, aroma, strength, and resilience here for there to be significant aging possibilities. Peculiar. 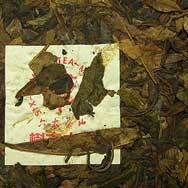 The leaf is very dry and quite large, turns leathery and a kind of pale green color when brewed. Strange smell, feels a bit "industrial" when brewed. Not bad, but for me this is an average tea. An interesting curiosity though, worth the sample.